Healthy leadership teams produce healthy churches! This material can help you strengthen your team. 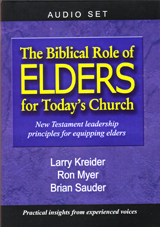 Included in this series are the New Testament leadership principles to train elders to provide protection, direction and correction in the local church. Taught by Larry Kreider, Ron Myer and Brian Sauder.